How many goat farts does it take to power a lightbulb? That’s the question on the lips of environmentally-conscious New Zealanders. OK, maybe not. But feedback from our #CleverFlickers shows, loud and clear, that they want to know how their personal electricity use contributes to NZ’s carbon footprint (a.k.a. how many goat farts’ worth of carbon emissions their household is creating). Want to understand how your energy use fits into the bigger carbon picture? With Flick, you’ll get the tools to make that happen. We’re 100% on that wavelength too, so we’ve given our app an overhaul, and with that comes the new and improved CHOICE tool. Cool. So why does it matter? Sadly, there’s a veritable hydro lake full of misinformation out there, surrounding retailers who claim to sell ‘green energy’. 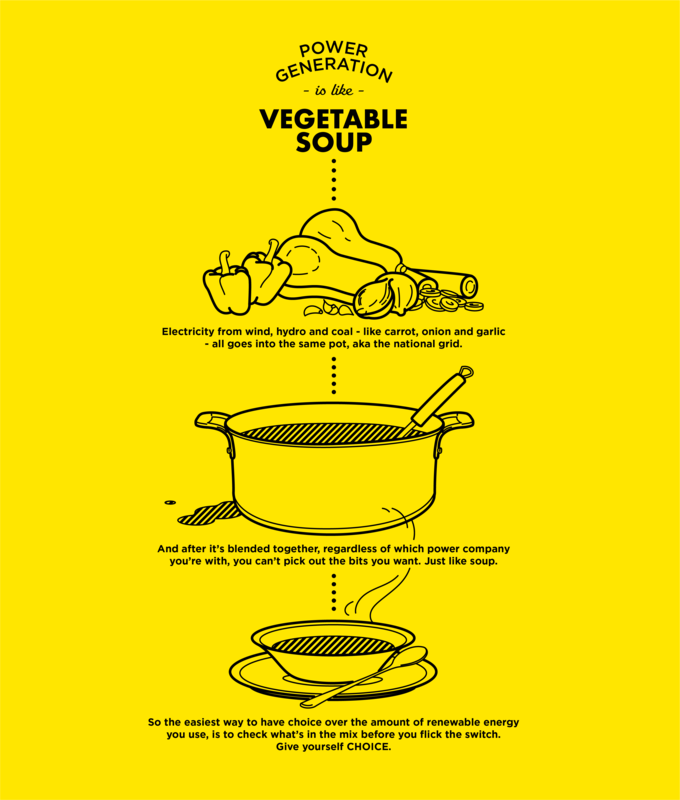 The fact is that, much like vege soup where everything’s thrown into one big pot, all our electricity generation - the clean and the dirty - goes into the National Grid, and then out to our homes and businesses. There’s no nice selecting of renewable power, or discarding of the stuff which creates lots of carbon emissions (no matter what some companies say). Flick’s world-first app has always given Kiwis live updates about the carbon impact of our electricity use, and sends alerts so you know when to switch things on and off to reduce your carbon impact. But here’s the VIP ticket: Flick customers now get information about their personal carbon footprint, measured in farting goats, so they can see how much carbon their power use contributes. Flicksters can also choose to offset their carbon use by making a donation to the wonderful charity, Trees That Count. They’re on a mission to plant millions more native trees that count – for climate change, for biodiversity, and to enhance our beautiful country. Boom! Farting goats aside, how will you work out that info? Every half hour, we receive info from Energy Market Services (EMS) about the types of generation being used (like coal or hydro), and we multiply that by the emissions factor for each energy source (supplied by MBIE) to get our numbers. To work out the unique carbon emissions of each Flick household, we take the info calculated above and factor in your usage to determine your personalised emissions. This won’t be a precise calculation because we can’t track electrons, but an estimate of your contribution to the national total. If you’re a facts and figures fiend, you can read more about how we calculate emissions here. So, why does Flick care about carbon? Social responsibility has always been a top priority for us here at Flick. We understand that, as a company, we’re only as strong as our community and the natural environment that supports that community. This is particularly true when it comes to our role as a power retailer. The way energy is produced and consumed is a critical piece of the carbon puzzle, and we want to do everything we can to help our Flicksters not only be conscious consumers, but also active contributors to decarbonising New Zealand. That’s why we’ve done the mahi, so that Flicksters can see their emissions info with the swipe of a finger. Too easy! Flick’s carboNZero certified! Find out exactly what that means over on our blog.